As a teenager, Jeff worked as a drillers helper during the summer and school vacations. After graduating from the University of New Hampshire with a degree in Business Management, Jeff joined his father (Elmer) and brother (Dan) working full-time at Tasker’s Well Company. His responsibilities in the company have increased to include all aspects of the day-to-day operation of the company, both in the office and in the field. 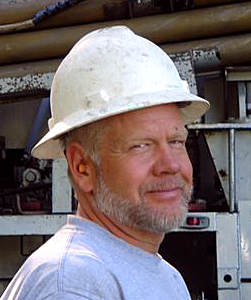 He holds licenses in New Hampshire, Maine and Massachusetts as a well driller and pump installer. Jeff has enjoyed a high level of success in the well drilling industry. As a member of the National Ground Water Association, he is proud to be one of less than 100 drillers in the country, and the first in New Hampshire, to attain the prestigious status of Master Ground Water Contractor. Master Ground Water Contractors have proven their knowledge in all aspects of the industry. Over the years, Jeff has served as President, Vice President and Director of the New Hampshire Water Well Association. Most current, Jeff has been the well driller member of the New Hampshire Water Well Board from 2003 to 2010 and was Chairman for two of those years. Jeff’s family includes wife Diane, children Curtis, Nicole and Kyle, and grandson Aidan. When time permits, Jeff enjoys hunting, fishing, playing with his dog Riley, watching old western movies and visiting with family and friends.